Grassroots activism is a method of campaigning for a cause that the activist or activists feel strongly about. Grassroots activists are often at the complete opposite end of the political spectrum from those in power. But these campaigns are often surprisingly effective when it comes to making a change. At its most basic level, grassroots activism is a group of people who feel strongly enough about an issue to actively campaign to make a difference. 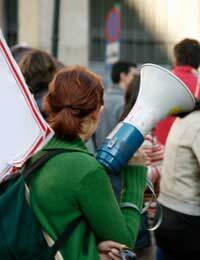 Grassroots activism relies on the basic rights to freedom of speech and expression by individuals when it comes to trying to make a change to a particular issue. This type of activism is not controlled by any particular political party. They are an independent group of people who feel strongly about a certain issue and are willing to put in the effort to affect a change on the issue they are concerned about. In a number of cases there will be individuals involved in grassroots campaigns who do hold political power. It could be politicians who pick up on a certain campaign through the media and believe in the issue strongly enough to add their support. In some cases this could look like the actions of a political party trying to gain favour from the public. However in many cases it will often be that the politician does actually support the cause and wishes to help the people involved in the campaign. Once a grassroots campaign starts to pick up momentum it can be very effective when it comes to making a change. A successful campaign can start off with one or two activists that can soon turn into hundreds and even thousands. If the media picks up on the campaign then this can make a real difference to the cause. If the cause has significant support it can effectively change government policies and laws. Recent protests have included marches against the war in Iraq to campaigns to stop knife crimes in London. These have been protests started by a small number of people that grew to huge numbers through the strength of feeling regarding the particular causes. Although most grassroots protests are intended as peaceful demonstrations for change this has not always been the ultimate outcome. Many activists have been arrested and in some cases endured time in prison due to their strong beliefs. Animal rights protestors often use extreme methods to highlight their protests including breaking into testing facilities. Protestors against nuclear disarmament in Britain are frequently arrested when they hold sit-ins outside warhead manufacturing plants. Some campaigns can last for many years and take real commitment from those involved. Anyone who feels strongly about an issue can start their own grassroots campaign. The power of the Internet has made a real difference to the way campaigns are now run. Thanks to social networking sites it is now easier to recruit like minded activists and organise protests and campaigns. This is grassroots activism at its most basic level but it can make a difference and change the public’s attitude towards certain issues. Enlist Bangladesh Chhatra League (BCL) as a Terrorist Organization Bangladesh Chhatra League (BCL) is an armed wing of Bangladesh Awami League (BAL) which is currently ruling the People’s Republic of Bangladesh since 2009. BAL has been ignoring fair and inclusive election for all. A sham election with virtually no opposition was held on 5 January 2014. In November 2018, another general election is planned which will be another display of wide-range of corruption, intimidation and frauds. To stay in power, BAL has been using BCL against general population during all types of peaceful protests. However, all limits have been crossed when BCL began attacking and terrorizing unarmed, vulnerable school children who are peacefully demonstrating across the country, particularly in Dhaka city, demanding road safety measures which is an extremely corrupt and dangerous sector in Bangladesh. Every year, more than 10,000 people die due to reckless driving and unfit vehicles. BCL has been attacking all types of people, including women, elderly, indigenous peoples, unarmed university students for a while with impunity and under the protection of the current government and police. But this time, it has crossed all limits as they are now targeting children as young as 10-12-year olds. BCL has transformed from being a menacing armed youth body of a political party to a terrorizing organization with complete impunity. Enough is enough! We, the people of Bangladesh, must protect our children. And now we fervently demand, through this petition, to the United Nations and security services to enlist BCL as an armed terrorist organization that preys on and crashes general people, especially children of Bangladesh. We appeal for peace and justice and that is why we are reaching out to the international community to find avenues to protect children of Bangladesh. We are seeking your help! To start with, BCL needs to be globally recognized and registered as a terrorist organization. Would like to be notified of any women issues, as well as marches/ movements. Thanx. Doing this would not be lawful of course....even though it's a public building, you are only allowed to be there within the specified opening times or you're trespassing. However, a protest has to draw attention and this will certainly do that. If you're holding placards maybe you should arrive earlier than the 30 minutes you plan. There is nothing to prevent you staging an all day protest if you wish...and if all you're doing is reading and holding placards, you're not breaking any rules. If you feel refusing to leave will help the publicity (and we think you're probably right), then the worst that can happen is that you will be arrested and to be honest that's highly unlikely if you all agree to move on when asked by the police. Remember to invite a member of the local press along! Let us know how you get on.